An introduction to the traditional principles of Tai Chi, as viewed through the lens of modern medical science. A simplified Tai Chi protocol, including extensive descriptions and photos of the exercises that you can do on your own, similar to regimens that a number of clinical trials have demonstrated to work. Insight into the underlying physiological processes that explain how Tai Chi can improve your health. State-of-the-art, objective summaries of the research literature that highlight what is and what is not yet known about the health benefits of Tai Chi. How the Eight Active Ingredients of Tai Chi can be integrated into personal and professional relationships, improve work productivity, enhance creativity, and boost sports performance. 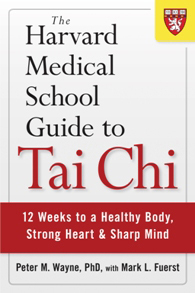 The Harvard Medical School Guide to Tai Chi has also been used to create an online course. Learn More Here.